My friend Vanessa was born with her finger on the pulse. 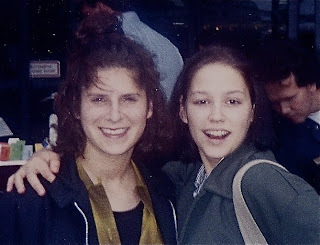 When we first met, I was a junior in high school and had recently moved to Boston from Syosset, Long Island where my California transplanted family had just spent a very grueling, unhappy year. I was the new kid once again, trying desperately to find "my people." Then I met Vanessa, a magical sprite in sea of strangers. Vanessa was a sophomore yet she possessed the effortless cool, generous spirit and warmth of someone wise beyond her years. At fifteen, she was the assistant manager of a cool independent coffee chain in Boston called The Coffee Connection. She and I became fast friends and she introduced me to a world of colorful characters, exotic food, wine and crazy strong coffee. Yes, we were teenagers and we were drinking wine but we drank it like grown ups at cafes with small plates. That makes it okay, right? I'm on the left, Vanessa is on the right. And yes, regrettably, that is a scrunchie in my hair. This picture was taken before digital cameras existed so that's why we look like ghosts. Now here we are, many (ahem) years later, living just ten minutes away from each other on the opposite end of the country and she's still keeping me dialed in to all the cool spots. 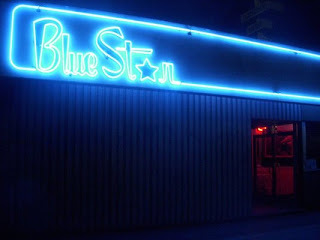 We recently met a restaurant downtown called Blue Star. Walking up to the retro-inspired diner, I had a major deja-vu moment. When Vanessa and I were teenagers living in Boston, she took me to a kitchy chrome studded diner with a giant coffee cup on the roof called The Blue Diner. I distinctly remember the cute chef who kept his hair cropped short but had a few small dreads hanging just over his brow and a cigarette dangling from his lips (you know, cuz when you're sixteen, that's cool.) It was a spot you had to be "in the know" to discover and sadly, it has since closed. I mentioned the similarity to Vanessa as we walked through the door of Blue Star and she said, "You're right! No wonder I like this place!" Blue Star is a little more low key in terms of décor. It still has that diner feel with comfy bench seats, condiments on the table and an ample menu, but there's also a bar and a back patio depending on your pleasure. We ordered a veggie burger with a side of their "Famous Macaroni and Cheese" as well as a chopped salad. Vanessa had tried the mac before and suggested we go for the side order as the main order is ginormous. The side is $2.50 with a sandwich order and the main will set you back $10.50. The mac arrived sans crumb top but with a little blanket of melted Cheddar cheese sprinkled over cavatappi noodles. I applauded their choice of cavatappi noodles, the same noodle used in the mac and cheese at Max and Dylan's in Boston. It's the silly straw of macaroni noodles, a corkscrew shaped noodle with a hollowed out center. I just love an innovative noodle, I can't help it. 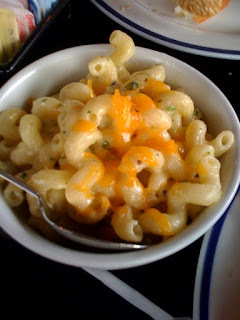 Before we dug in, I could see this mac and cheese was crawling with chives. You can take a look at the photo and see them scattered throughout. I want to take a minute here to thank the good folks at Blue Star for listing the cheeses used on the menu. It's annoying when restaurants don't want to divulge the "secret" cheeses. I mean, it's not like I'm rushing home to recreate it so I can open up a competing restaurant across the street. Big ups to Blue Star for not suffering from paranoia. The cheeses used were Parmesan, Cheddar and Mozzarella. After the first bite, the strongest flavor takeaway was the garlic and the chives. The Humboldt Fog would not like this mac because it's garlicariffic and she shuns garlic, but I really enjoyed the herby, spicy kick. The cheese combination worked well to create a very creamy, stretchy cheese sauce, and the garlic and chives, which may have been roasted as there were little crunchy bits in each bite, gave this mac a very appealing texture. Now of course, I would have preferred a crumb top but I think this preparation was very inventive and memorable. It wasn't your average, run of the mill mac and cheese so Blue Star gets another point for creativity. The rest of the food was good, nothing mind blowing but it's perfectly acceptable comfort food in a nice mellow atmosphere. Vanessa has another spot earmarked for us to try sometime soon and while I love me some mac and cheese, getting to spend time with my awesome friend is what it's all about.